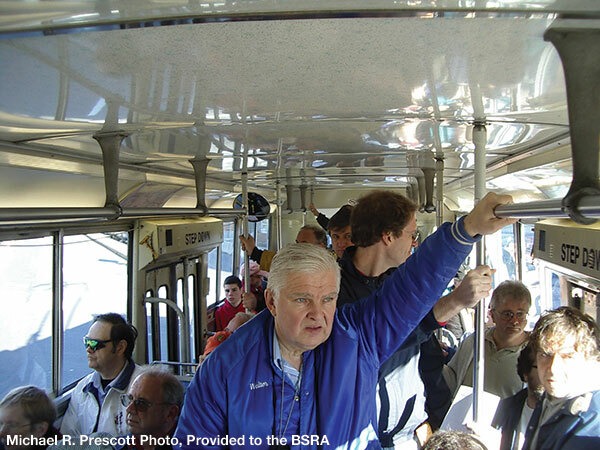 History of BSRA Fan Trips | Boston Street Railway Association, Inc. The Boston Street Railway Association is well-known for its ability to run a wide variety of “fan trips.” They are always fun, informative, very popular and, sometimes for unintended reasons, very memorable! Fans shoot a posed “meet” of a Canadian Light Rail Vehicle on a fan trip (while the car was visiting Boston from Toronto) and an MBTA LRV, headed for Boston, on the Lechmere Viaduct in Cambridge. Bradley H. Clarke Photo. As of September 2014, the Association has successfully operated 111 fan trips, which have ranged from a tour of the Fitchburg & Leominster Street Railway Company to a complicated multi-modal system tour using a Dual-Mode Articulated Bus! Our fan trips often provide their attendees an opportunity to ride on seldom-used portions of track or enter restricted areas not open to the general public. In many cases, unexpected “bonuses” occur en-route that lead to more excitement and add to the historic experience. In addition to scheduled fan trips, the Association membership has also participated in several memorable events that have occurred on the local transit system, the most recent of which have included the last trip over the North Station Elevated in 2004, and the last run of the Boeing-Vertol Light Rail Vehicles in 2007. In these cases, Association members and local transit fans gather to attend these milestones on “impromptu” fan trips that interact with the riding public in a unique and educational way. 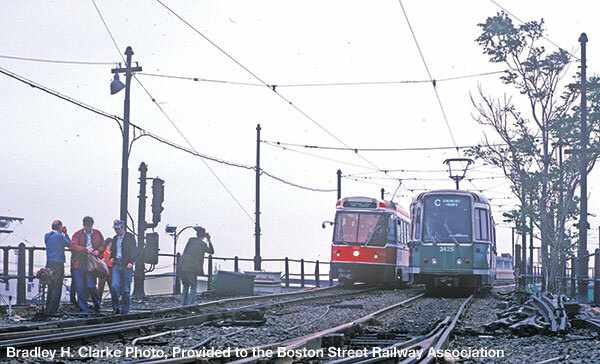 While the heyday of the PCC has passed, and there are fewer unused portions of streetcar trackage left in the Boston area, the ever-changing nature of transit operations guarantees subject matter for future fan trips for decades to come, as we say “farewell” to outgoing vehicles and lines, and welcome their successors.